GWP Director and current BREEAM Assessor of the year, Barry Rankin, was recently invited by BRE to hold individual consultation on the BREEAM Assessment method, including development of BREEAM 2014 New Construction criteria as well as presenting to the wider BREEAM team of consultants, technicians and support staff on the challenges of undertaking BREEAM Assessments to ‘Outstanding’ levels of compliance. Barry discussed the unique approach GWP Project Services take to meeting BREEAM compliance, through exceptional levels of communication, use of leading BREEAM assessment tracking software and an ever expanding knowledge base from playing a key role in the delivery of multiple BREEAM ‘Outstanding’ rated assessments. The day at BRE Global’s HQ in Watford was considered a resounding success. 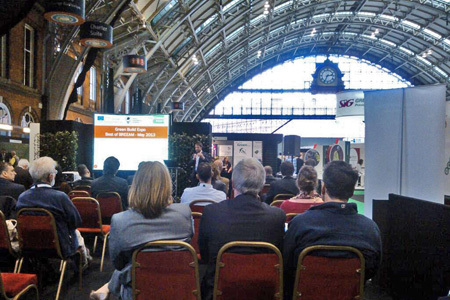 A similar presentation was given to a public audience at Greenbuld Expo in May 2013 and has been part of strategic consultation services delivered to some of the UK’s largest Building Contractors over the last 12 months to demonstrate the key issues required to efficiently and effectively deliver successful BREEAM assessed buildings.